June 17, 2009 - Little Rock, Arkansas, Plano, Texas - CAD Manufacturing Solutions, the developers of CMS IntelliCAD CAD software and Motive Systems, the developer of M-Files document management software, today announced the availability of CMS Vault by M-Files, a powerful document management solution that is now included with CMS IntelliCAD. 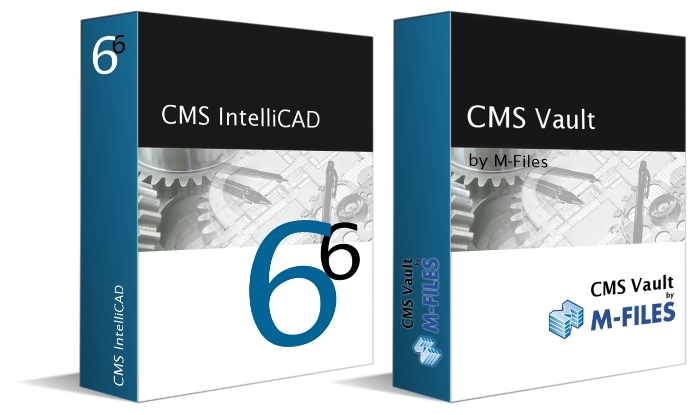 CMS Vault by M-Files is based on the popular M-Files document management software and provides the ability to organize and manage CAD drawings created with CMS IntelliCAD, as well as all other office and business documents. CMS Vault features include fast search, secure user access permissions, check-in / check-out and version management. "CMS Vault by M-Files delivers IntelliCAD users one of the best document management solutions available," said Vitor Neves, President of CMS. "CMS IntelliCAD offers the broad CAD market an affordable and powerful alternative to Autodesk AutoCAD. CMS Vault is easy to use and supports all company documents in addition to CAD files." "We're very excited to be working with CMS to broaden the market for our world-class document management technology," said Greg Milliken, General Manager of Motive Systems Inc. "CMS Vault by M-files provides a great example of how we plan to work with software vendors to help provide easy to use document management as complement to software applications in a variety of industries." About CAD Manufacturing Solutions, Inc. Motive Systems develops easy yet powerful document management solutions enabling companies of all sizes in a variety of industries to make dramatic gains in efficiency and productivity by improving the way they organize and manage electronic content. More than 30,000 licenses of the company's products have been sold worldwide, with the flagship product M-Files in use at customers such as AstraZeneca, Parker Hannifin, EADS, FinnComm Airlines, BSA LifeStructures and Thales. Motive Systems also offers M-Files Express, the only completely free professional document management system on the market. IntelliCAD and the IntelliCAD logo are registered trademarks of the IntelliCAD Technology Consortium in the United States and other countries. M-Files is a registered trademark of Motive Systems Oy. All other registered trademarks belong to their respective owners.